The delivery of the second S-400 regimental set is expected to begin in late July, according to a Russian government source. 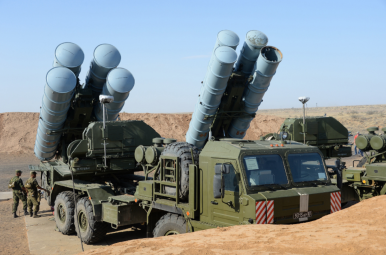 The second batch of Russian-made S-400 Triumf long-range interceptor-based air defense systems (NATO reporting name: SA-21 Growler) destined for service in the People’s Liberation Army’s Rocket Force (PLARF) is slated to begin in late July, a Russian government source said on April 3. “The transport vehicle with the first batch of equipment from the second S-400 regimental set for China will put to sea in the Baltic in late July this year, that is almost five months earlier than the term set in the contract,” the source was quoted as saying by TASS news agency this week. The total transport will consist of three vessels. Notably, the source did not specify when the second and third ships will deliver their cargo. The Russian Ministry of Defense (MoD) has neither confirmed nor officially commented on the supposed delivery date. China received its first S-400 regimental set in 2018. Delivery of the second regimental set was initially expected to be completed by the end of last year. However, Russia claims that a ship carrying an export variant of the S-400’s most advanced interceptor, the 40N6E, reportedly capable of intercepting targets at a distance of up to 400 kilometers, was damaged in a storm in the English Channel in early 2018, delaying the completion of the order by a couple of months. The standard S-400 battery consists of four transporter erector launchers (TELs) with four large launch tubes or 16 smaller tubes (or a combination of the two) per TEL, in addition to long-range surveillance radar target acquisition and engagement (fire control) radar systems and a command post (vehicle). In the Russian military, two batteries make up an S-400 battalion (also known as an S-400 division), whereas an S-400 regiment consists of two battalions. Each TEL can carry four long-range or up to 16 short- and medium-range missiles. An S-400 regiment also possesses additional surveillance and target acquisition radars, with the unit generally plugged in to larger long-range radar stations or airborne early warning systems. It is, however, unclear whether Russia has developed such a so-called Cooperative Engagement Capability (CEC). The Russian military has been training PLARF personnel on the S-400 air defense system over the last months. The PLARF has also conducted a number of live fire tests as part of the weapons systems’ user trials in November and December 2018. Russia is set to train another 100 Chinese servicemen for the PLA’s second S-400 air defense system regiment.